Established in 1827 on the campus of Union College the Sigma Phi is considered to be one of the oldest Greek fraternities on the territory of the United States. It is also known as the first National Greek Organization. When the Beta of New York at Hamilton College was established in 1831 it The Sigma Phi fraternity established its chapter at this college. So, it became the first fraternity with a chapter at another college. The Sigma Phi fraternity is a secret organization, so its practices and rituals have not been discovered yet. 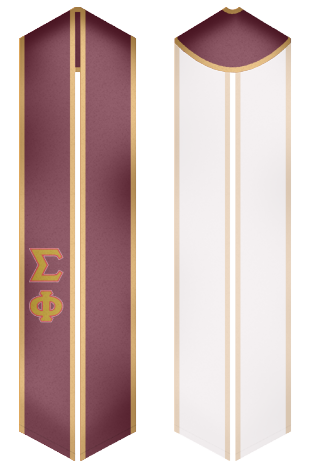 Custom Sash offers a lot of beautiful stoles, which are especially designed for students of the Sigma Phi fraternity!